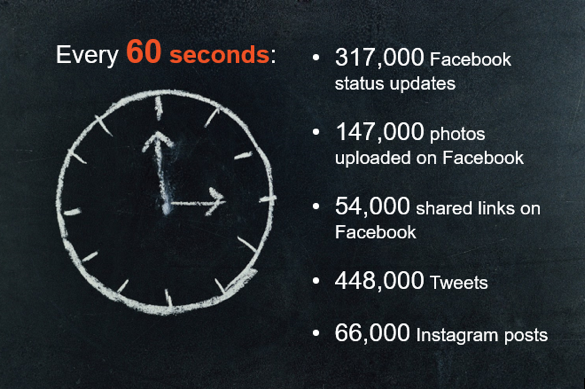 These incredible stats show that we are completely surrounded by information on social media. We can therefore guess that this explains why the average customer’s attention span went down from 12 seconds in 2000, to only 8 seconds in 2017, according to the National Center for Biotechnology Information. That is officially less than the attention span of a goldfish (9 seconds). Knowing this fact, half of you probably left this blog post already. But let’s keep going. Why is it so important to have visual content when posting on social media? First of all, 40% of nerve fibers to the brain are connected to the retina, and it takes us only 0.25 seconds to process visual content, compared to the time it takes for the brain to process text-based or verbal information. But isn’t text actually visual content? Not exactly – text is like a lot of little images, that’s why it is faster for our brain to process “real” visuals like images or videos than text. Some sources even suggest that visuals are processed 60,000 times faster than text! Besides, eye-tracking studies show internet readers pay close attention to information-carrying images. In fact, when the images are relevant, readers spend more time looking at the images than they do reading text on the page. Not convinced? Well, I guess you didn’t even see the word “cat” added in the pizza recipe above. This is simply because your brain focused only on the image since it is easier and faster to process, and barely on the text. Since visuals are easier to process for the brain and we allocate only a few seconds for each piece of information, it is logical to use systematically visual content when posting on social media. Bottom line, the best practice when posting on social media is to publish visual content as much as possible instead of text only, as long as the visual is of course relevant. Ideally, custom images or videos should be created for each post. For example, infographics are a great way to create custom content. Infographics are “liked” and shared on social media 3X more than other any other type of content! Utilizing custom created visual content is a great way to present any kind of information. It is also a good solution to bypass the word count limits for Facebook Ads or Twitter.